Revit : My staggered wall is not cleaning up!!!! Now in reality short stepped walls like this are not that common place, but on buildings that are brick and blockwork construction it’s not that uncommon to see this type of detail. However, take a closer look at the wall; the materials are not cleaning up!!!! 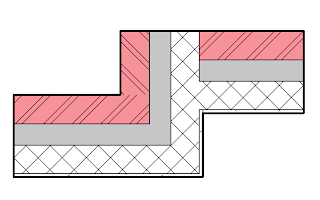 Initially I thought this was a bug, I went back to my old copies of Revit, even as far back as version 6 and this typical wall detail worked. Then I remembered that wall cleanups had been improved in version 9.1. But the above situation did not look like an improvement! So after some experimenting and playing I discovered that selecting the walls in a particular order, clicking the blue node point at the end of the wall, would force the cleanup to how you would expect it. So give it a go, draw the wall layout as above. 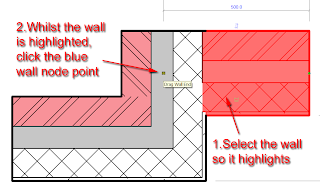 Next select the top parallel wall so it highlights red, whilst it is still selected click the blue node at the intersection of the walls. Next select the bottom parallel wall, so it highlights red and click the blue node at the intersection of this wall. This will automatically force the cleanup. The resulting walls cleaned up. Thanks for this morsel -- I've never run into this problem, but at least I'll know what to do. This is a terrific tip that I adapted successfully - almost. I have created wall families with different core thickness (all remaining components the same) and aligned the interior face to create a pilaster. I have created wall families with different exterior finish thicknesses (again, remaining components identical and aligned at the interior face) to create a different kind of pilaster. With one significant problem. 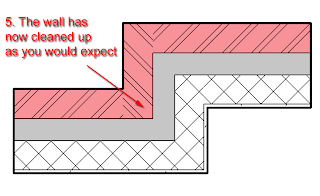 I can "break" my adaptations if I adjust the length of the walls. Any suggestions? I can provide an example or image if you wish.